What did you have for breakfast on Sunday? Sunday Waffles – No Bread in House! 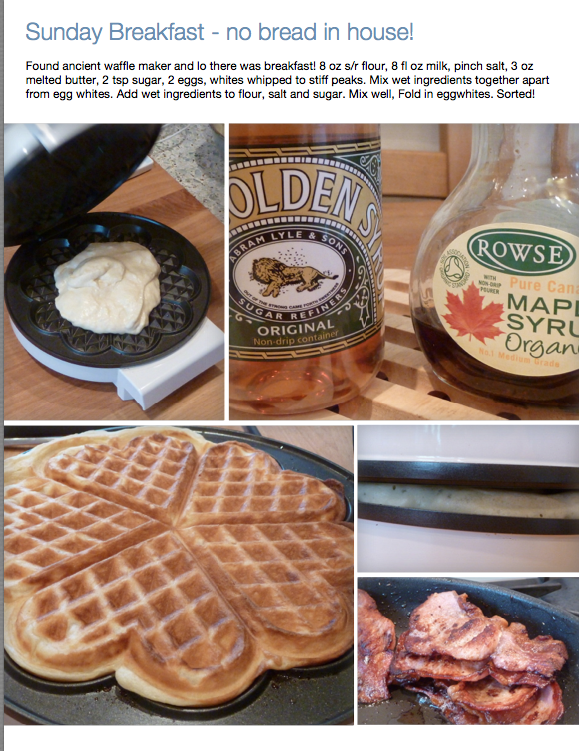 Those waffles look perfect, great for a cool damp Sunday morning. I’m making bagels for a Sunday brunch. I am at least a week behind, I think I’m going to make meringues this pm and a fruit cake, we have lots of dried fruit from Christmas. Delicious………but 5 waffles and two people! How did that work out, or did Zeb have one? My breakfast was a banana and a cup of black coffee (my usual breakfast) while prepping for a baking session. I usually read over breakfast – being active that early in the morning is not me at all! Thin toasted white sourdough bread topped with a fried egg. The bread itself was a bit of a disaster that I “rushed” yesterday because we had no bread in the house (should have done pancakes!) – learned my lesson there – a rushed sourdough equals a housebrick. That said, it tasted just fine toasted. I have taken a before and after shot – I left it 2 1/2 hours and it felt good as I placed it on the hot baking tray and there is a good oven spring. Oh and it smells divine…! rye toast and Greek yogurt with Australian honey and lemon-ginger tea. I made bread wraps again yesterday- today I’m making some white toasting bread for the coming week. Bread and yoghurt and honey sounds like summer in Greece to me – and the tea sounds delightful too. I haven’t managed to bake any bread today, what is going to become of us ? Brown Soda bread which I made yesterday, topped with Stilton cheese, followed by a slice of Chocolate Hazelnut Cake which I also made yesterday. They look lovely! Boring breakfast here – needed to be out fairly early. Apple then a rhubarb yogurt. Longley Farm yogurt though – proper taste, not sweet and runny like many. Don’t think you get Longley Farm in the south do you? I could never find them when I was at uni. your waffles look so pretty..confession..i’ve never eaten one..my mother used to make them for my children when they were little and i know they like them so if i was a good mother i’d get onto it.. Your waffles look so tempting. However I’m on a rye sourdough mission; I’m using Dan Lepard’s rye sourdough starter recipe from baking with passion. I’m at day 9 now and can use the starter; do I need to refresh each day or can I leave in the fridge for a few days without feeding? When I need to refresh is it always the above formula? 1 spoonful of active starter (25g) to 60-70 g of new rye flour and 50 g of water if I wanted to keep it without feeding for a few days. A bit more flour than water will give the culture more food to eat. If you leave the starter without refreshing it you will notice the bubbles disappear and a layer of clear, darkish liquid (hooch) often appears on the top. This doesn’t mean the starter has died, simply take a little of it, put in a clean jar and feed again and it should come back to activity over a couple of feeds. I wrote a post called Weekly Sourdough which you might find useful which talks about keeping the sourdough in the fridge, quantities, how to feed and so on and refreshing it twice over a 24 hour period before you bake with it, if, like many people, you only want to bake once a week. Each teaspoon of starter contains masses and masses of wild yeasts and lactobacteria and is capable of refreshing a surprisingly large quantity of new flour and water. Once your starter is active you don’t need to keep so much sitting around as you will only end up throwing most of it out. How often you bake and how much bread you are making in any one session will dictate how you need to care for your starter. Hope this helps. I’ll look at your Weekly Sourdough post; thank you so much. The starter is very active at present and smells like apple cider, I was concerned about the quantity I ‘m giving to the compost worms each day……….they’re obviously very happy on their new diet;it’s all gone by the next day.